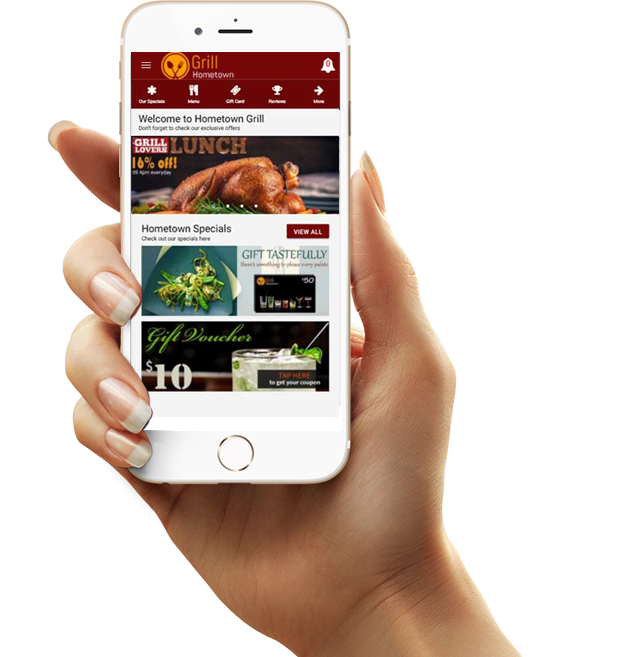 Let users browse your menu, reserve tables, and order to-go with your Webkon instant app. Webkon changes the way your Restaurant interacts with new and existing customers. Use Google Eddystone and Beacon technology to send notifications of specials and coupons to customers inside your restaurant. Capture new revenue by offering online ordering with Webkon 3rd party integrations. Organize galleries of menu items with high quality images, prices, and descriptions. Using Webkon’s 3rd party integration with Appointy, allow users to skip the wait and reserve their table with your instant app. Webkon’s 3rd party integration with seamless and other online ordering applications allows you to capture new revenue and expand your services. Send push notifications to customers inside your restaurant with redeemable offers like extended Happy Hour and $5 off their $65 purchase. Your customers say great things about your restaurant. Let new customers know what others have to say with 3rd party review integrations with Yelp. With our powerful Menu feature, you can display all the best items your restaurant offers. The items can be endless. Now you can display a huge sumptuous menu with several sub-categories like Appetizers, Entrees, Signature Dishes, Happy Hour Specials, Seasonal Items, or even menu items for specific events such as live sports or races. There is no treat like visual treat! With Webkon apps, you can instantly make a new customer by just displaying a high definition photo of your mouth-watering signature dish. By just looking at the pic, half the customers will place an order. Webkon apps support augmented reality. Add photos of happy customers enjoying lavish meals to improve sales. Webkon apps allow the restaurant owners to make real-time instant changes. The customers do not have to update their apps or wait for the app to upload from an Android or Apple store to view the changes. Webkon apps allows the content to get instantly updates. Make as many delicious offers as you want in Christmas or Thanksgiving. With Webkon apps, restaurant owners can improve sales and revenue. With the help of Advanced Data Analytics, you can capture, observe, and analyse data that can help your business improve such as bestselling food item in each month, bestselling drink, most popular meals, bestselling campaigns, month with highest sales, or festival with highest sales. Based on the reports you can tailor your services to ensure a growth in business. Let us show how Webkon can help your business. Visibility Through Browsers. Online sales can be improved only by understanding the pattern of your business, customer behaviour, and your tailor-made service. We make it easy to give your content visibility through the Physical Web for Android users as well as iOS users with any Physical web supporting browser like Google Chrome. With our powerful Beacon technology, everyone with a mobile device can potentially see your offer directly on their smartphone or tablet! Whether it’s the championship football game, Taco-Tuesdays, reverse happy hour, or a food truck at a farmer’s market, you can show 1 Special Offer or Multiple Special Offers. You can easily re-engage your customers while they are in your proximity. Webkon apps allows you to track customer behaviour and customize services that suits their taste buds. With our app, the restaurant owners can circulate feedback or review forms that can help you make changes in the menu depending on their likes and dislikes. With these reviews, you can make critical business decisions. The reviews help you serve better and positive reviews help in expanding business. Restaurant industry needs strong engagement models to keep their business up and running. Webkon apps lets the restaurants to re-engage with their customers by sending them push notifications. You have a new addition in your menu, send a notification to each of your customers. Your customers will receive the notification even if their devices are in offline mode of the browser is close.